Think this describes me? What's yours? Problem with authority? You? No way! All of them are more interesting than mine. 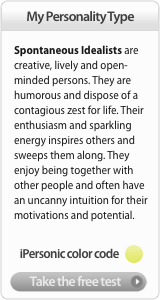 I am an "Energetic Doer". Nearly a perfect description of me actually. Even to the part where it says I shouldn't be in a relationship with someone that is cautious and aversive to taking risk. And sure enough, that is what drives me the most crazy with my wife... Although, I definitely need the balance. The facebook personality tests says that you are the friend with the most similar personality traits as me. They deem it my "personality soul mate" but clearly we would shred each other to pieces... We nearly did and you were only dating my roommate! ha! I am a Reliable Realist. I agree with most of what it says. Mom - That description certainly sounds like you!